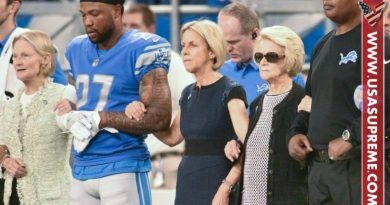 NFL players protest is a national sick joke !! They picked the wrong forum & manner for this issue. The national anthem & flag are honored at sporting events for veterans that served & gave their life for our country. NFL players abuse women & animals & yes there are some bad cops but Disrespecting Country. Vet’s & Flag is a dishonor, not a protest !! The right to protest does not make it right !! It seems that even America’s team surrendered one of the last teams that were defiant and I thought they could never bend the knee! Yes, you read right the Dallas Cowboy and their owner Jerry Jones kneeled yesterday! After this action, Jerry Jones has no credibility! We all remember when he issued an unequivocal statement to his players. Jones told his players that they have to stand during the playing of the national anthem if they want to suit up in the silver and blue this season. Following a weekend of kneeling and protesting across the NFL, the Cowboys and their owner displayed their own version of unity Monday night, kneeling on the field before rising as a group before the playing of the national anthem. 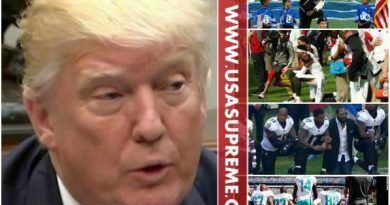 President Trump – yet again – waded into the NFL protest debate, this time calling attention to the moves of the Dallas Cowboys last night. ‘But while Dallas dropped to its knees as a team, they all stood up for our National Anthem. Big progress being made-we all love our country!’ Trump noted. 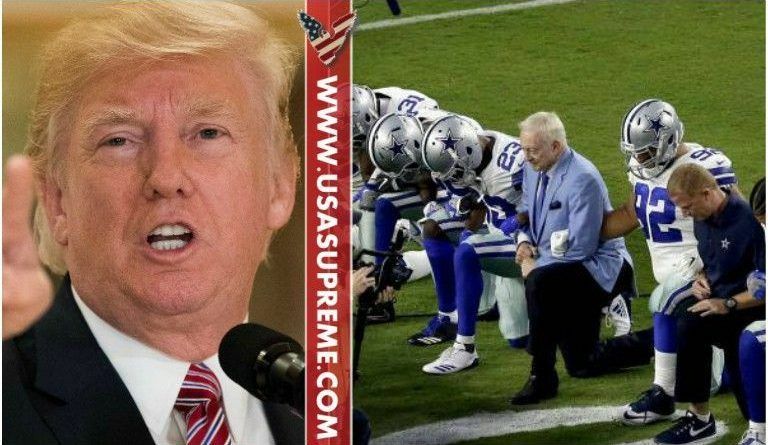 At an away game in Arizona, the entire Dallas Cowboys NFL team, including owner Jerry Jones and coach Jason Garrett, dropped to their knees prior to the playing of the Star Spangled Banner, in a move that showed solidarity for the football players who have been kneeling to protest racial inequality. Trump has hammered their efforts in recent days. The president was reportedly pleased with the reaction his comments were drawing, according to those who attended a White House dinner with Trump Monday night. WAKE UP AMERICA This isn’t about disrespecting the flag, it isn’t about black slavery, it isn’t about all the supposed innocent blacks being killed by cops, this is about dividing our country into many groups for the NWO to conquer us, if we all hate each other then we won’t ban together against the NWO, it’s all in the plans and you idiots on the field kneeling are playing right along with it. Even ESPN and the other sports channels are getting in on this political stance to divide us more. Sorry folks but GOD wins every time. 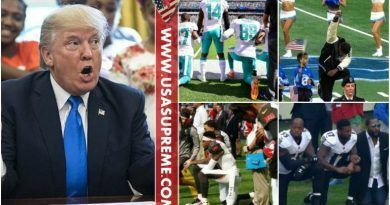 I sat let’s share this and boycott NFL! ← Mike Rowe Had Said Few Things About The Whole NFL Fiasco…’Dirty Jobs’ Host Spared exactly No One! For every problem their is a solution. So maybe we the people should kneel in a moment of silence before standing for the anthem. As it’s said in God we Trust ! All the NFL players are just sad!! Leave your whining political and social views at home, not at work! Nobody cares about your feelings. You want to fix something? You can’t do it by taking a knee. Stand up like a man otherwise you are just seen as weak!! Kneeling is an act of submission. Am I the only one that wonders how a submissive act is a protest? Standing at attention with cover removed and hand over your heart honors all those that have protected your freedom and have served to guarantee your rights remain in place. How is it that you think this is the place to protest the different things it is being said you are protesting by this?